We are excited to announce that we’ll be hosting our annual User Conference in Niagara Falls. Whether you’re a decision maker, front-line employee, back-room employee, agent, branch supervisor, market analyst, trainer, IT expert, etc., if you use the AXIS software directly or support AXIS software users, this conference is for you. This year’s theme is “AXIS Positioning for the Future.” Join us in discussing expanding member outreach opportunities and hear how AXIS will become more available in the cloud . As per the format last year, the Travel, Membership, System Administration and Road Service Working Group members will meet the afternoon before the conference (May 6th) to participate in pre-conference planning meetings and roadmap discussions. New this year will be a Business Intelligence session (9:00 am – 10:30 am) and Insurance session (10:45 am – 12:15 pm), both on May 6th. The conference kicks off with a Welcome Dinner on Monday, May 6th at 6:00 pm. On May 7th, the General Session runs from 9:00 am until 12:00 pm. After lunch, we will offer three concurrent streams: Membership/MRM, Travel and Road Service. Join us for a casual and fun evening at 5:15 pm. Please plan on sticking around for the morning of May 8th for our Kiosks. Not only will you get to speak one-on-one with our Product Managers, you can also speak to our sponsors from Rocket Software and Shift4. At 10:30 am, three grand prizes will be awarded, however, you must be present to win. Please refer to the agenda for more details. Keep in mind: Your registration price includes all learning sessions along with meals and refreshments for each day. 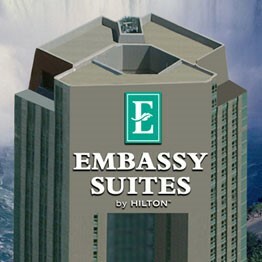 We have a secured a special room rate of $149 per night at the Marriott on the Falls, the venue for our User Conference. This rate is available three days pre/post conference. Complimentary internet is included in the room rate. Discounted self-parking rates of $19.00 per night plus applicable taxes for those staying overnight. Complimentary internet is included in the room rate, as well as a full buffet breakfast. Parking is available at $30.00 per day plus applicable taxes. Please note that should you require to cancel your reservation, you must provide the hotel with 72 hours notice in order to avoid being charged one night’s room rate plus applicable taxes. Use the Special Rate Code “CSI” in the Group Code Section. The cut-off date to make your hotel reservation is April 1st, 2019. Meeting attendees will be responsible for paying room charges and incidentals directly. To receive a cancellation refund (less a $50.00 administration fee), cancellations must be made in writing to Trish Eleftheriadis before April 12th, 2019. Cancellations received after that date are non-refundable. You are welcome to send a substitute attendee at no charge if you forward us written notification no later than three days prior to the conference. Registration is now closed. Please contact Trish Eleftheriadis for any questions or comments.